Ulrike Müller, 'And Then Some,' 2016, installation view, Callicoon Fine Arts, New York City. Courtesy of the artist and Callicoon Fine Arts. Photo by Sean Fader. Ulrike Müller and Taloi Havini will discuss the activation of history and the socio-political dimensions in their work on Tuesday, February 20, from 6:30-8pm. Join us at ISCP on Tuesday, February 20, at 6:30pm for Brooklyn Commons: Ulrike Müller and Taloi Havini. Müller and Havini will discuss the activation of history and the socio-political dimensions in their work. 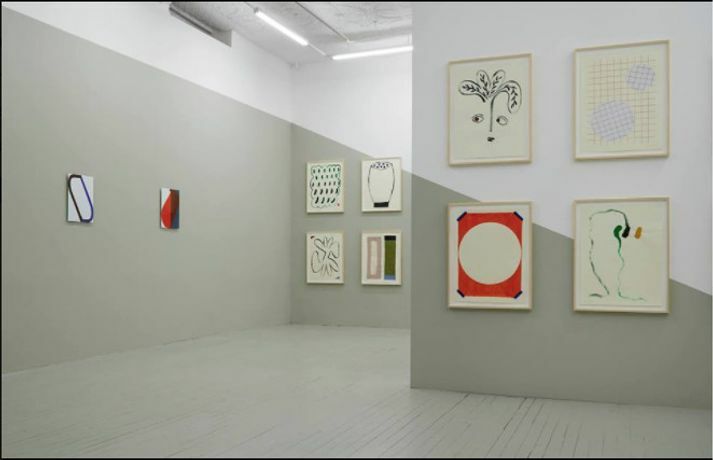 Brooklyn Commons, an ongoing discussion series at ISCP, presents intellectual and artistic pairings between the established Brooklyn-based artist community and ISCP artists in residence. This series, initiated in 2012, puts artists in conversation who have not shared a dialogue in the past and focuses on cultural practitioners living and working in Brooklyn, both long- and short-term. Ulrike Müller, MdEP (born 1971, Brixlegg, Austria) studied art at the Academy of Fine Arts Vienna, and participated in the Whitney Museum Independent Study Program, New York. She has been a co-editor of the queer feminist journal 'LTTR' and organized 'Herstory Inventory. 100 Feminist Drawings by 100 Artists,' a collaborative project that was exhibited together with objects from the respective collections at the Brooklyn Museum and at the Kunsthaus Bregenz in 2012. In 2010, Müller represented Austria in the Cairo Biennial. Recent solo exhibitions include Callicoon Fine Arts, 2016; Museum Moderner Kunst Foundation Ludwig Vienna (mumok), 2015; and Kunstraum Lakeside, 2014. Her work was included in the Whitney Biennial in 2017. Additional recent museum exhibitions include 'The Little Things Could Be Dearer,' MoMA PS1, New York, 2013; and 'Painting 2.0,' Museum Brandhorst, Munich, 2015. Taloi Havini (born 1981, Bougainville, the Autonomous Region of Bougainville, Papua New Guinea) currently lives and works between Sydney and Bougainville. Havini utilizes a wide variety of media to explore issues about keeping inherited knowledge systems alive across time and place. She engages with collections and archives and often responds to these experiences with experimental installations and exhibitions at institutions including the Sharjah Biennial 13; Palais de Tokyo, Paris; and Queensland Art Gallery and Gallery of Modern Art, Brisbane. Major support for Brooklyn Commons is provided by VIA Art Fund. This program is also supported, in part, by Create NSW; The Dr. K. David G. Edwards & Margery Edwards Charitable Giving Fund; National Association for the Visual Arts NAVA; New York City Department of Cultural Affairs, in partnership with the City Council; and New York State Council on the Arts with the support of Governor Andrew M. Cuomo and the New York State Legislature. This event is free and open to the public, and will be live streamed on ISCP's Facebook Live.